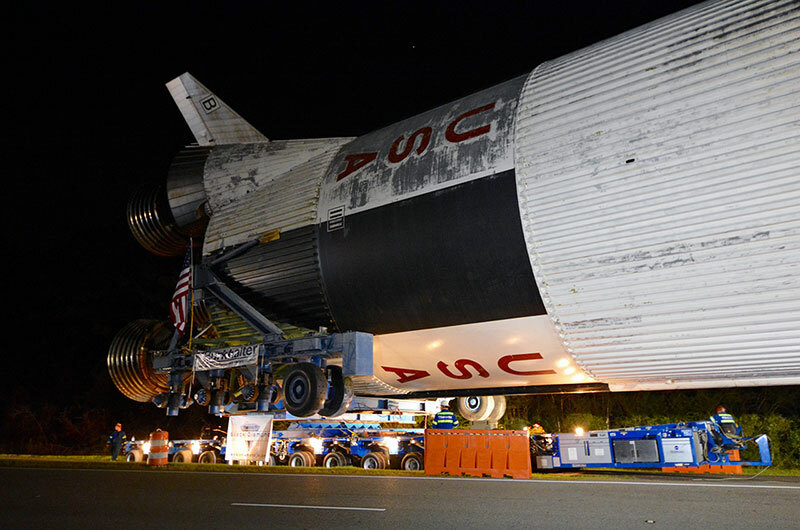 — A massive, 40-year-old relic left over from NASA's Apollo moon program has landed a new mission as a roadside attraction on one of the United States' most traveled highways. 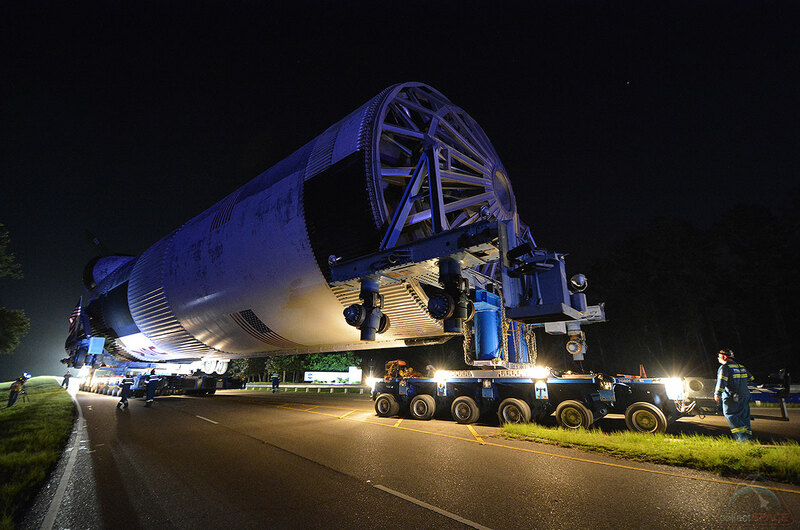 Drivers taking Interstate 10 to enter Mississippi from Louisiana on Tuesday (June 21) were the first to catch sight of the newly-delivered Saturn V first stage parked outside the Infinity Science Center, the visitor center for the nearby NASA Stennis Space Center in Pearlington, Mississippi. The 138-foot-long (42 meter), 360-ton artifact was moved overnight from Stennis, in part rolling down the same stretch of the interstate it now sits beside. 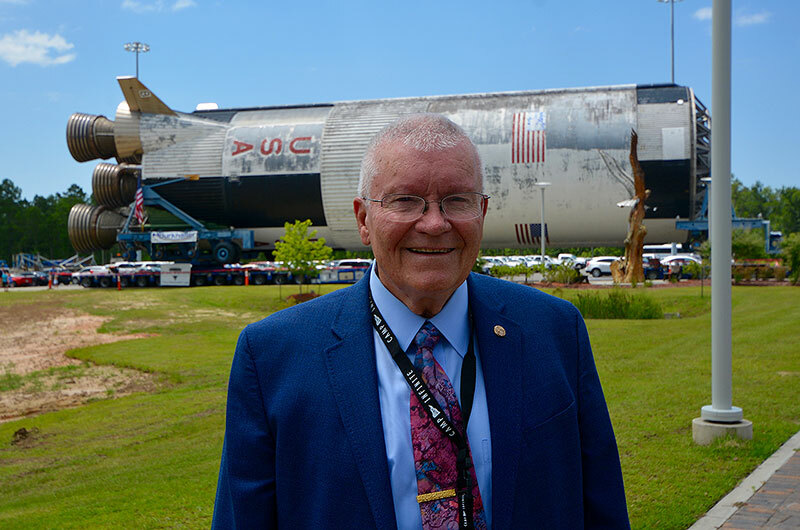 "This is an incredible day," said astronaut Fred Haise, who was slated to fly atop the rocket stage until his Apollo 19 moon landing mission was canceled in 1970. "We have an incredible object behind me here." Haise, who also missed landing on the moon as a crew member on the Apollo 13 mission, now helps lead the board of directors of the Infinity Science Center. 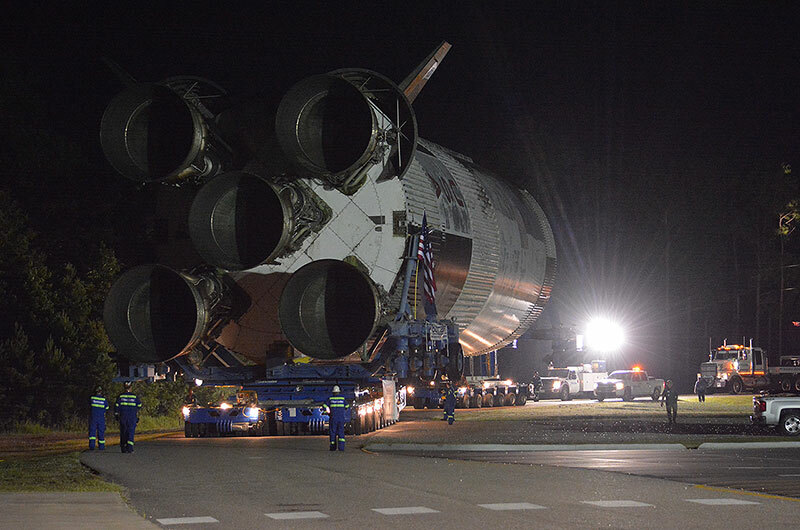 On Tuesday morning, he joined other center leaders, NASA officials and Mississippi Governor Phil Bryant celebrating the arrival of the stage at its new home. 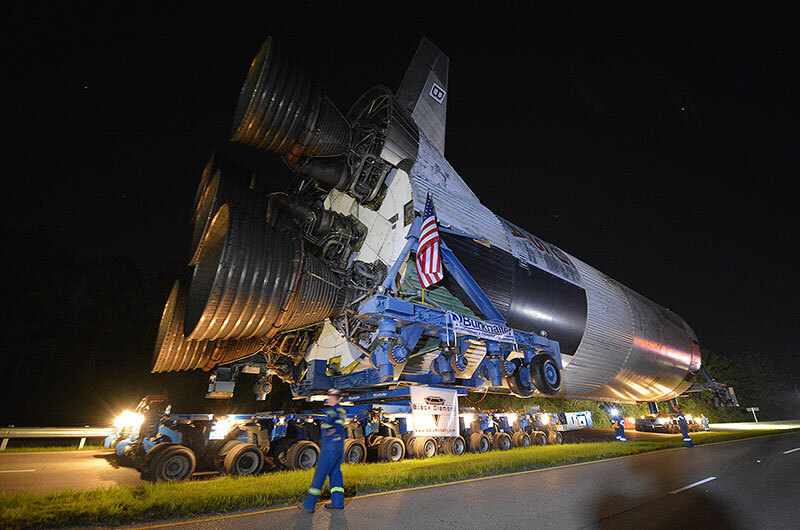 "This is a great first step in preserving this priceless artifact for the generations to come," said Rick Gilbrech, Stennis' director. 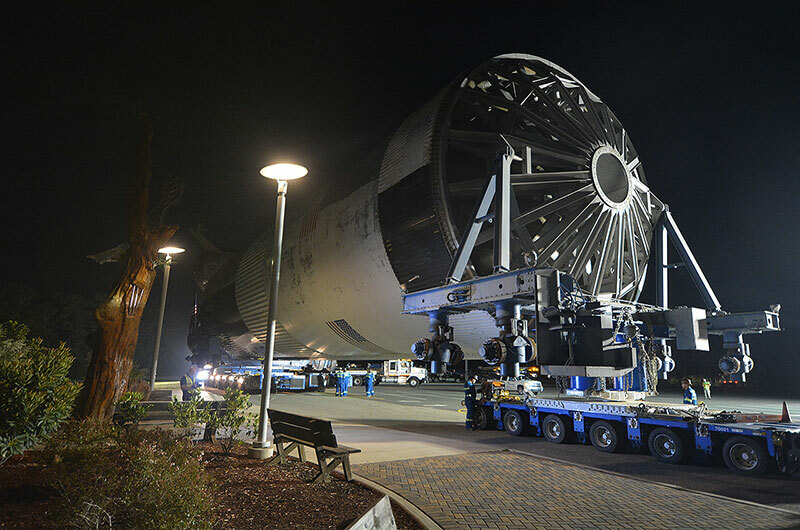 The stage, which served as the "business end" of the Saturn V rocket — its five F-1 engines providing the tremendous thrust needed to lift the towering booster off the launch pad — arrived at Stennis on Friday (June 17), having traveled by barge from its birthplace and display site of 38 years, NASA's Michoud Assembly Facility in New Orleans. "It is a bittersweet day," said Bobby Watkins, the director of Michoud. "The folks at Michoud, even though they are disappointed, realize this is the right thing to do." "[We] look towards the possibilities of inspiring the next generation by seeing this particular asset being restored to its rightful place in history," he said. 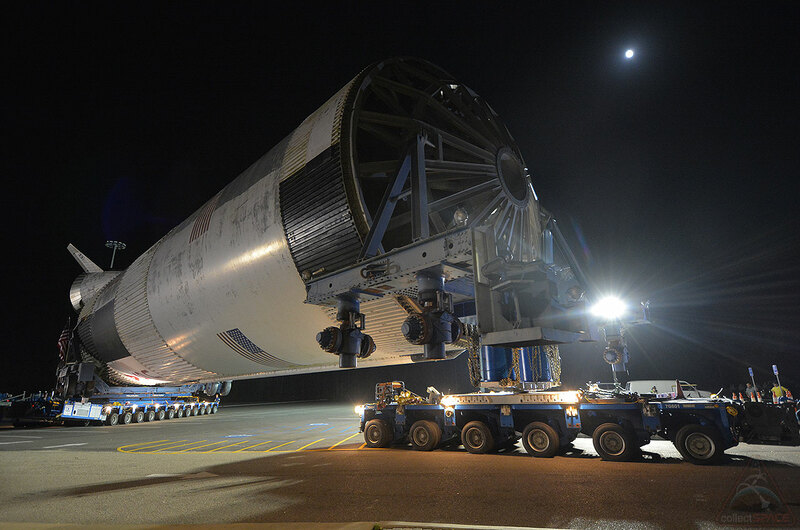 This is not the first time this stage, referred to as S-IC-15, made the journey from Louisiana to Mississippi. "For Stennis, this stage is no stranger to our site," said Gilbrech. 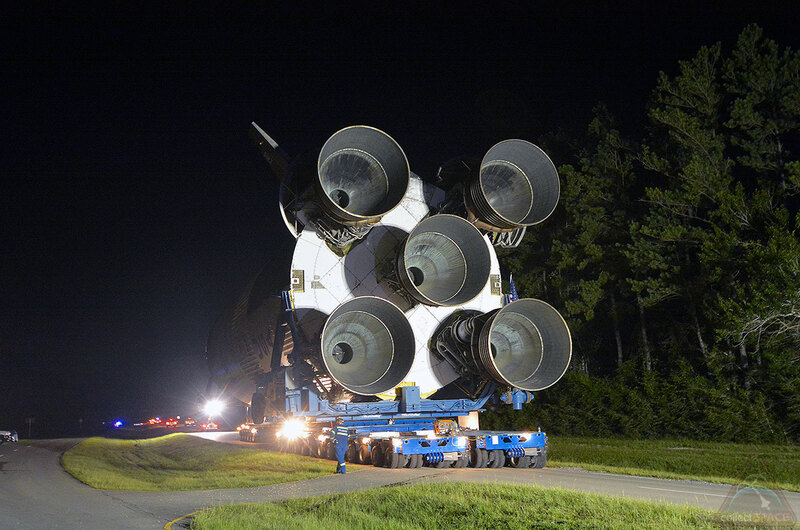 "We tested it 46 years ago and belched out 7.5 million pounds of thrust in our rocket test stand. 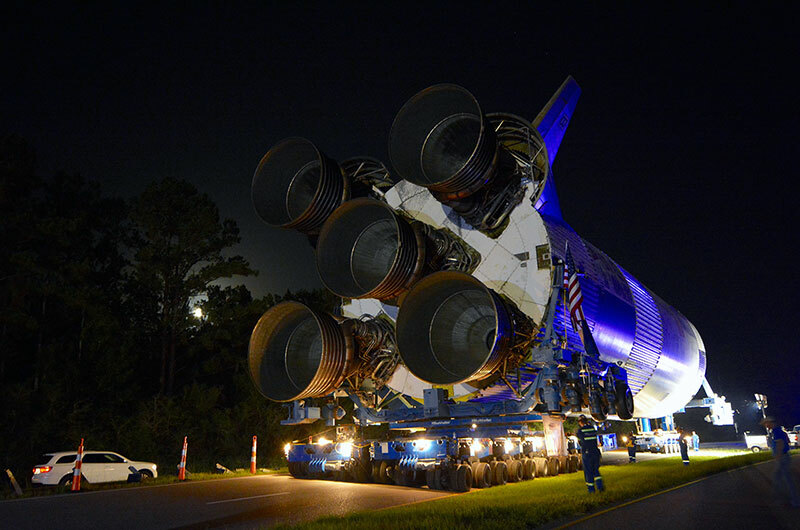 Then it went back to Michoud and queued for its next mission, the Apollo program ended and it was put on display out there." Four decades of exposure to the elements — including Hurricane Katrina in 2005 — have left the S-IC in poor condition. Its iconic black and white roll pattern has given way to bare grey metal and green mold. "As you can see, it is going to take more than a couple of little cans of touch-up paint to spruce this baby up," Gilbrech said. "We will take good care of it, we will spruce it up and we will shine it and will make it proud for everyone to look at," stated John Wilson, the executive director of the Infinity Science Center. The state underwrote the expense of moving the stage to Mississippi, but it will be up to Wilson and his staff at the science center to raise the funds needed for the restoration and the construction of a building to protect and properly display the S-IC. 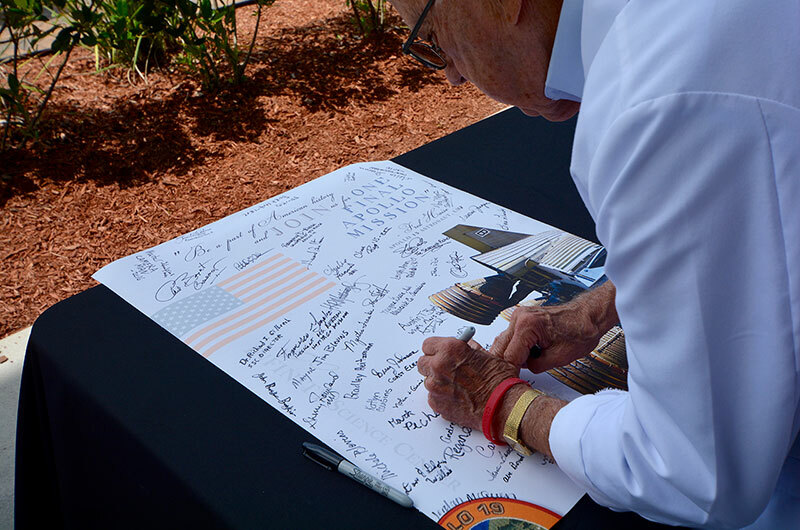 The science center is now accepting donations through its website, offering a souvenir Apollo 19 patch signed by Haise for contributions of $150 or more. 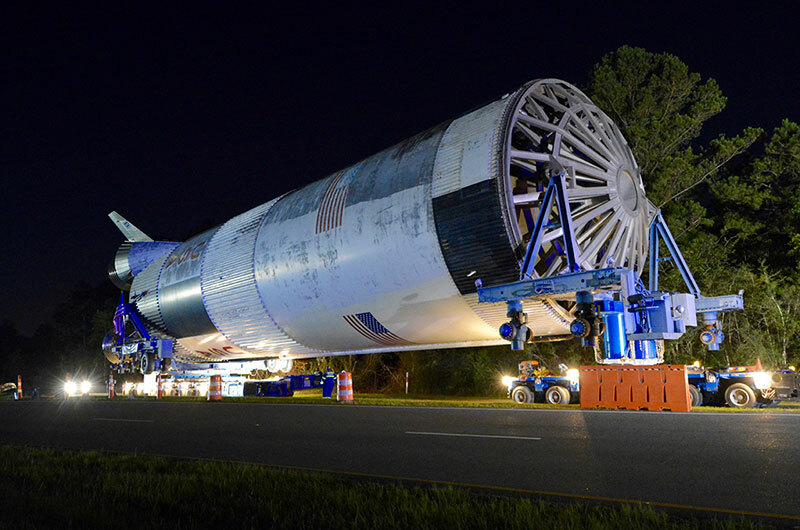 In the meantime, the center has built up an outdoor "landing pad" for the Saturn V first stage, positioning it so that its eye-catching F-1 engines point out toward the interstate. 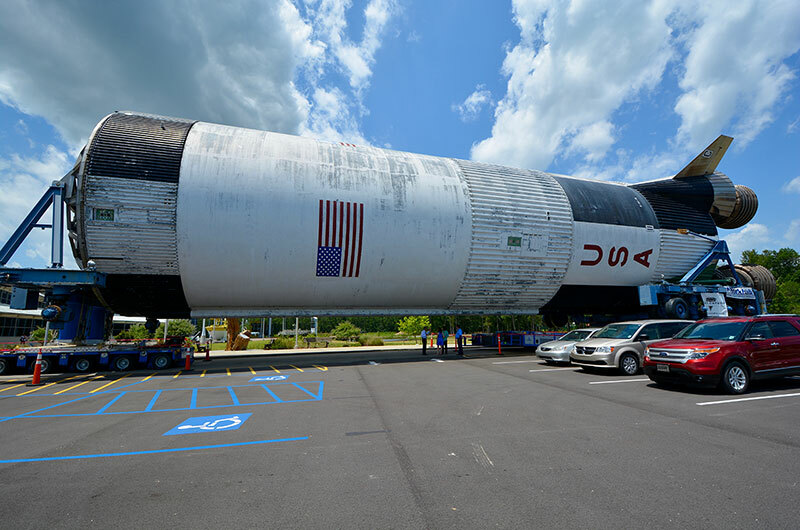 The hope is that the exhibit will encourage drivers to stop by and learn more about the role that Mississippi and the surrounding area has played and still continues to play in NASA's space exploration efforts. "That is what this day is all about," said Wilson. "It is about standing up this artifact as a vessel and instrument of inspiration." "We are in the business of building the next generation of Americans who can go build that type of stuff, and build it here in Mississippi and next door in Louisiana and amongst our neighbors elsewhere," he said. 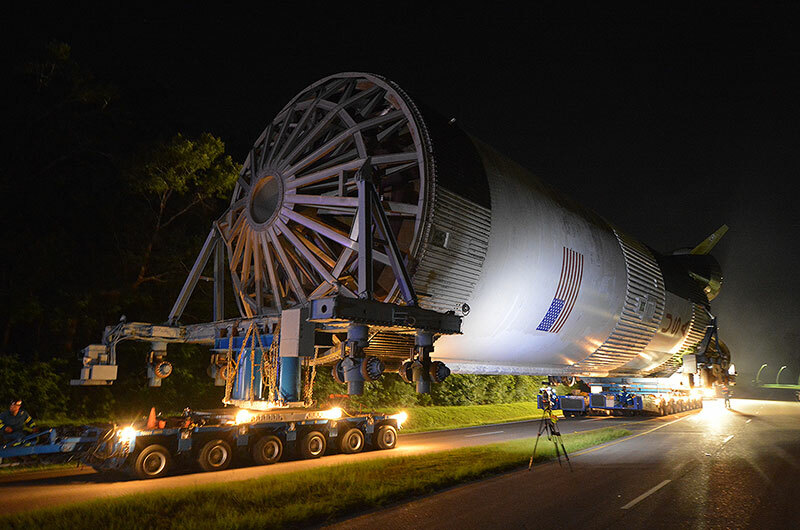 The Saturn V first stage, S-IC-15, left NASA's Stennis Space Center just after 9 p.m. CDT (1400 GMT) on Monday (June 20). 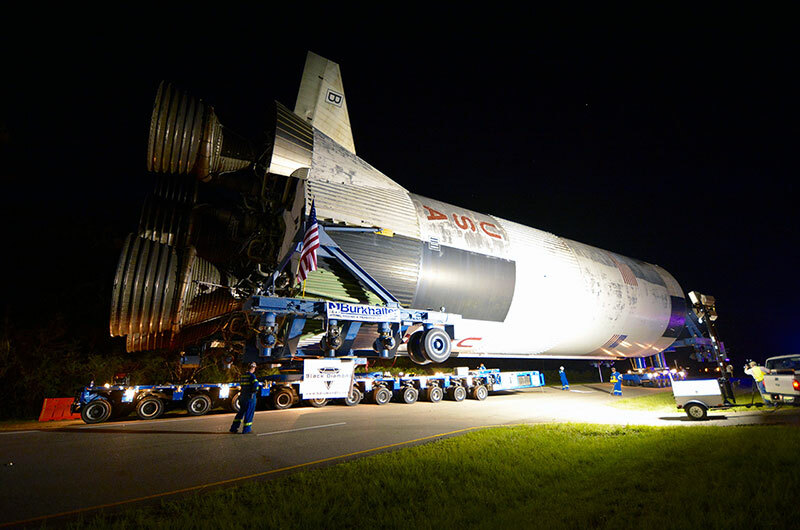 It had arrived at the Pearlington, Mississippi center by barge from the Michoud Assembly Facility in New Orleans on Friday (June 17). The stage was moved atop two multi-wheeled motorized transporters. 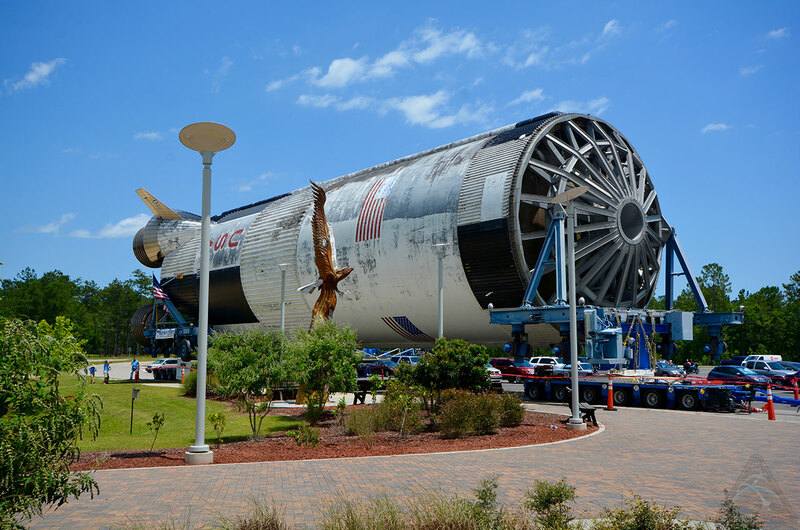 The stage's original transport is still attached and will be displayed with it to preserve the story of how the Saturn V rocket's parts were moved around the country. 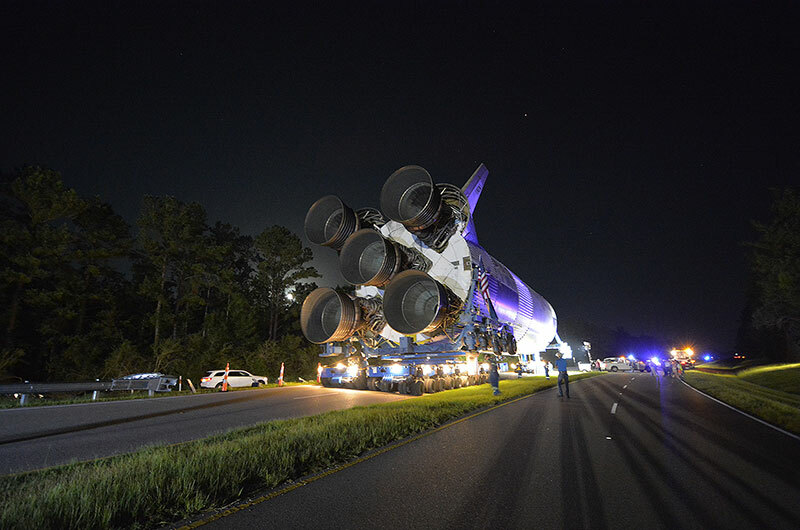 The stage first proceeded down Highway 607 before waiting for the Mississippi Department of Transportation to temporary close Interstate 10 to traffic so that it could complete the trip to the Infinity Science Center. 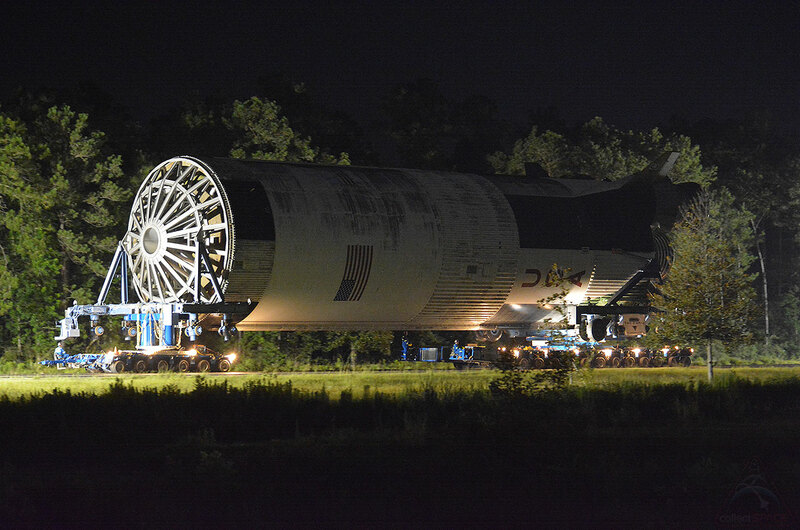 The Saturn V first stage is seen on Interstate 10 East (I-10E) passing in front of its new home, the Infinity Science Center. 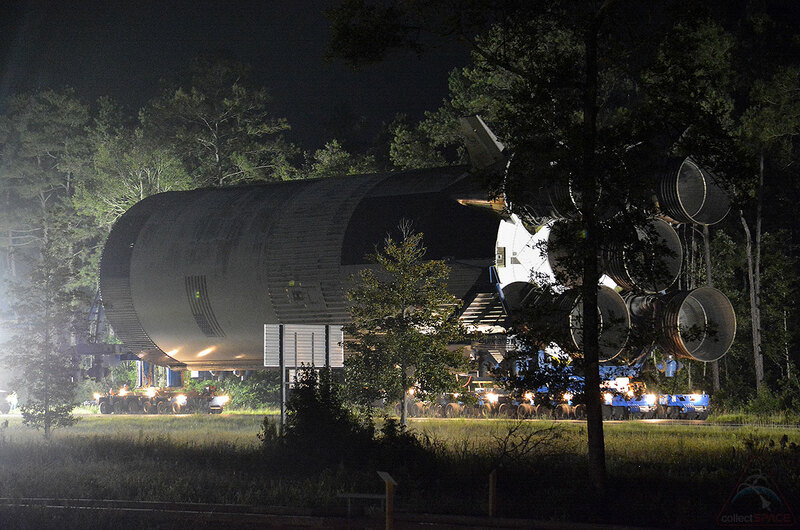 The Saturn V first stage is seen entering the Infinity Science Center's parking lot on Tuesday (June 21) at about 2 a.m. CDT (0700 GMT). The stage was moved on the summer solstice, the longest day of the year, under a full "strawberry moon." 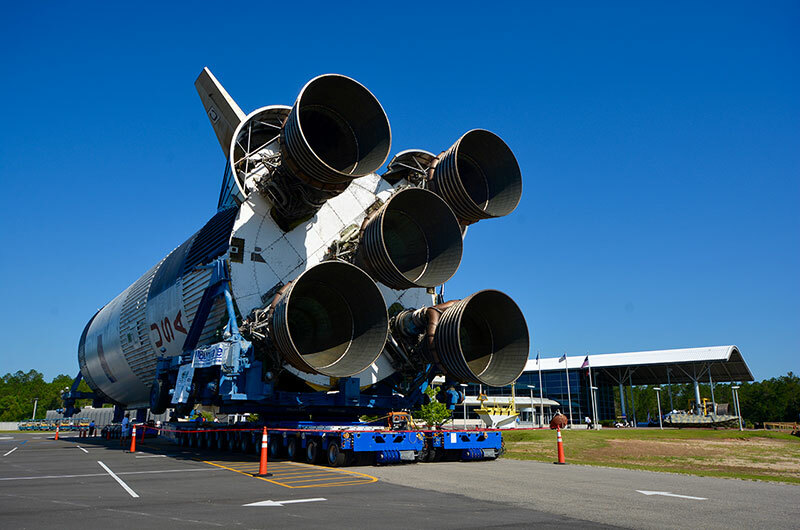 The stage was temporarily parked in front of the Infinity Science Center for Tuesday's ceremony. It will be moved to the side of the building for its outdoor display. 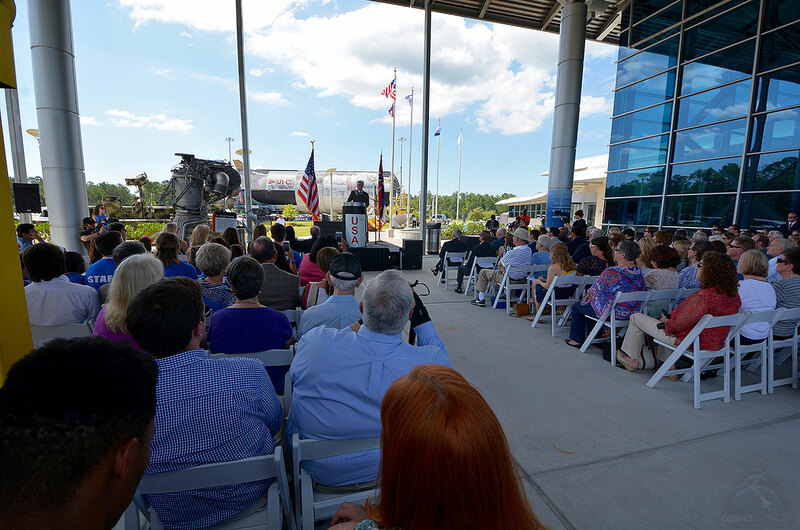 Infinity Science Center executive director John Wilson speaks at the welcome ceremony for the Saturn V first stage S-IC-15. 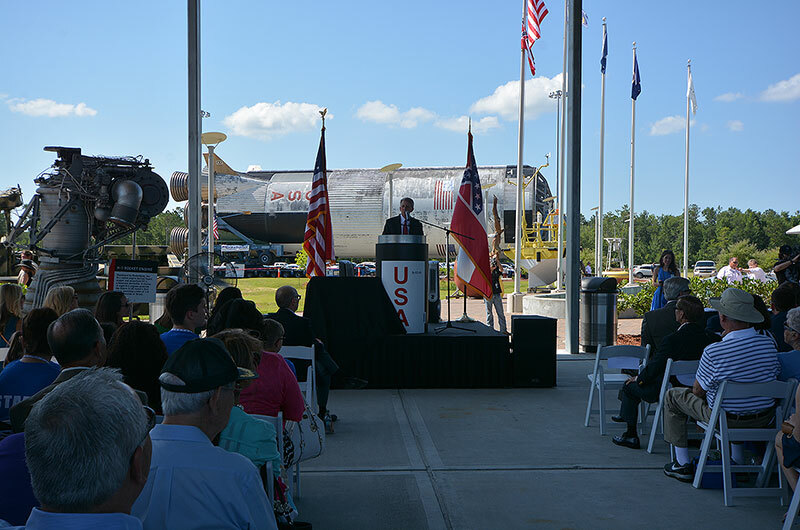 Mississippi Governor Phil Bryant welcomes the Saturn V first stage to the state during a ceremony held on Tuesday (June 21). Apollo 13 astronaut Fred Haise was slated to fly atop S-IC-15 as commander of Apollo 19, but the mission was canceled. Today, he serves on the board of directors for the Infinity Science Center, the new home of his former ride to the moon. 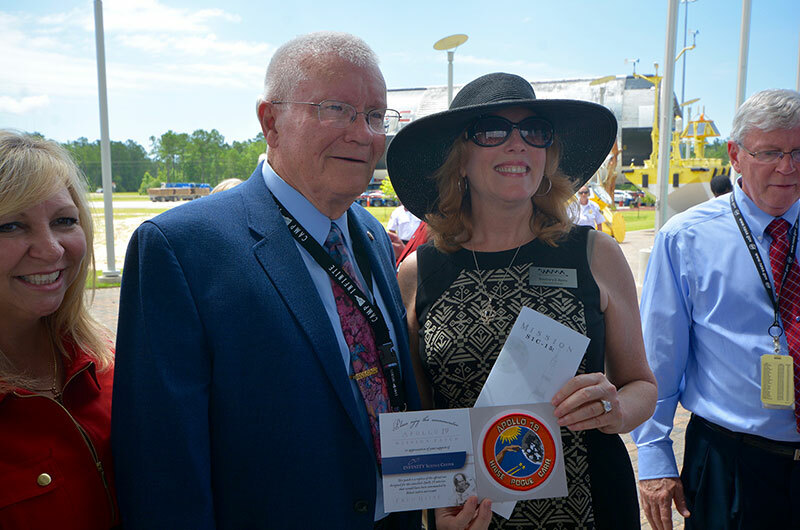 Apollo 13 astronaut Fred Haise poses with Rosemary Roosa, daughter of the late Apollo 14 astronaut Stu Roosa, who is holding one of the special Apollo 19 souvenir patches the Infinity Science Center is offering in return for donations to the stage's restoration. Ceremony guests were invited to sign fabric posters that will be placed into a time capsule not to be opened until 100 years after the Apollo missions. 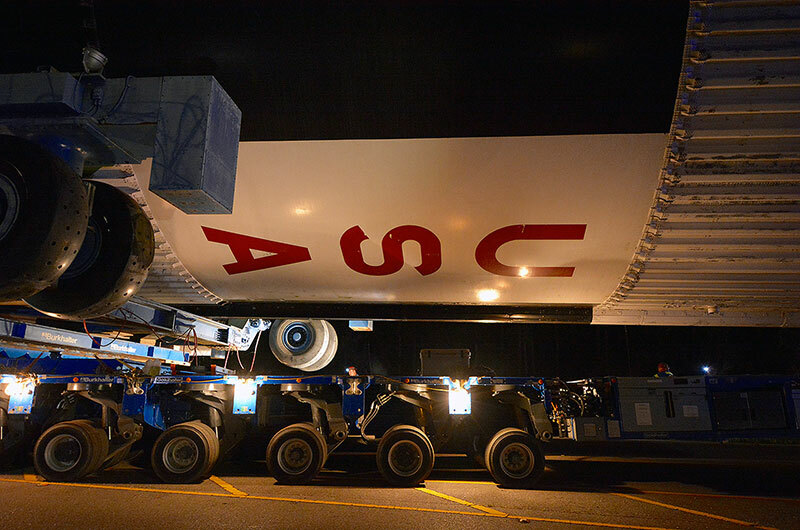 The time capsule will be mounted to the Saturn V stage's display. 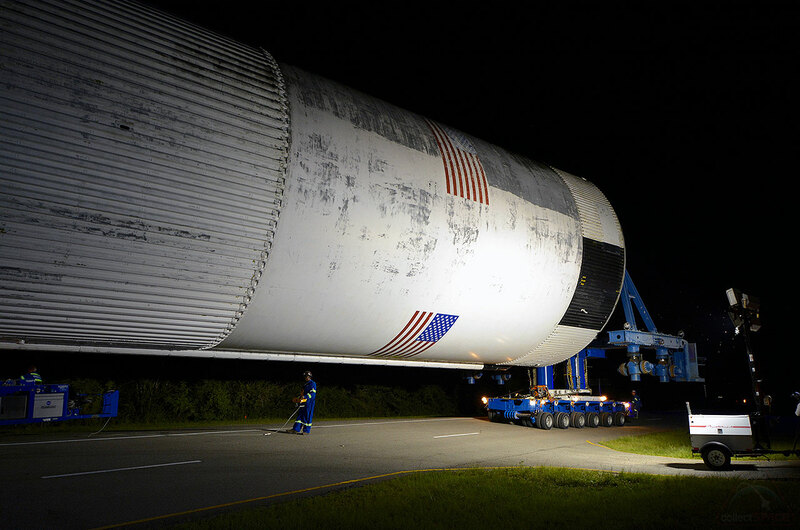 The 138-foot-long (42 meter) Saturn V first stage, S-IC-15, will be "spruced up" and restored to its original appearance.